We are not big television watchers. 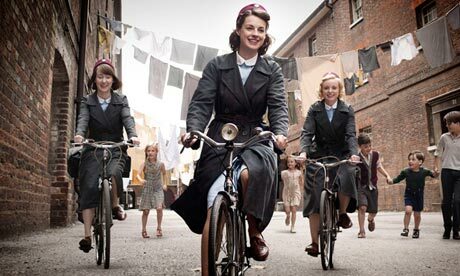 Not having 536 cable channels might have something to do with it but we compensate our viewing pleasure in other ways and our recent thrill (after marathoning Downton Abbey) is Call the Midwife. Being a dedicated multitasker, the small screen usually finds us doing something else at the same time but the late Jennifer Worth’s memoirs fleshed out with the BBC’s knack for colour continuity and period detail have proven that there are some things worth putting down your knitting for. This runaway hit about “women’s issues” and the field of midwifery pre-contraception in London’s East End in the 1950s has proven compelling – the characters are affable, the scenes range from the bittersweetly comic to the tragic and the plotlines broach all manner of “tough” subject without a moment’s hesitation. It is, as some have said, “magnificently subversive drama” that plays out with all the unexpectedness of life itself. We are fully engaged and the better for it. It’s not hard to see ourselves reflected in the bits of dialogue between the nursing Nuns of Nonnatus House. Much like 90 year old Sister Monica Joan’s dismissal of the Dewey Decimal system as “altogether too earthbound” in favour of an arrangement more distinctly eclectic, we too have been known to shuffle tomes and “put Plato here, next to Freud, so they can be companions in their ignorance…” Well aware of the oddly calming effect of placing books where we think they should be, rather than where most libraries would have them, we pull and replace, urging the Noir Style to rub shoulders with Strange Days, Dangerous Nights and squeeze the Explorers next to a mint Maharaja just for good measure. This methodology works as well for us as it did for the aged sister stacking volumes on a makeshift bookshelf until someone jams an action-thriller into 1001 Kitchen Organizers and we are forced to do triage once again. “How do you relax?” – with a good book or crashed on the couch, watching a mindless movie or birds in the park, fixing the old or creating the new, hiking up that mountain, running a mile, window-watching or sight-seeing… We would love to know how you recharge and restore. For all those who are new readers to Across the Bored, some great entries and the guidelines for this challenge can be found here: Need more info, want to browse past themes or get the badge for your blog? See HOW DOES THIS WORK.